In my ongoing efforts to bend the rules of magic to my will, I have yet another house-rule to present. Again it addresses Paradigm and Paradox, the two elements I find most lacking in nMage. 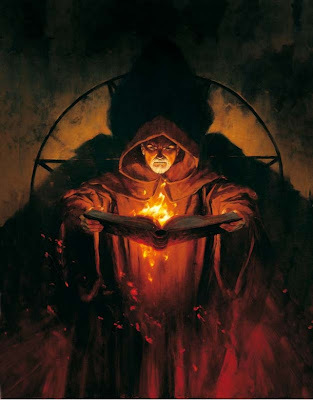 As is often the case, my homebrew lands somewhere in between Ascension and Awakening – this time I've also drawn inspiration from the nWoD supplement Second Sight (a most useful book covering Low Magic and other occult gifts accessible to mortals). At some point I will have to assess the earlier house-rules as well, and compile/rework them all into a single, hopefully stream-lined and comprehensive, document. For now, that's on my to-do list. This is the latest instalment. Paradox occurs when a magician attempts to cast a spell that is considered Vulgar. There are two primary factors that determine whether a spell is considered Vulgar: Paradigm and the nature of the spell. In the latter case, some magical effects are of such a nature that it's casting invokes the powers of Paradox. This can be influenced by the local Paradigm. The Paradigm can be likened to a metaphysical law-of-the-land, and it can change over time, according to world-spanning events, such as the Breaking of the Seal, or more local developments, such as long-term exposure to magic. Example: Imagine the two cites of Göteshafen and Marburg. The former's Paradigm is highly magical, allowing the Hermetic mages to cast most of their spells out in the open. Here such effects as Ball of Abysmal Flame, while technically being Vulgar, has a considerably lower chance of triggering a Paradox back-lash. Marburg, on the other hand, is governed by a low-magic Paradigm. Here blatant feats of magic will trigger the effects of Paradox. In contrast, many Aragonian and Corinthian cities have non-magic Paradigms, increasing the chance of Paradox even for Covert magic. Both the cities have native Arcane orders however, and these are working in the open, directly influencing and directing the every-day lives of the local inhabitants. This brings us over to the secondary factors governing Paradox, witnesses and magic style. As a rule of thumb, performing magic in front of Sleepers will increase the chance of a back-lash, but this is at best a modified truth. A crowd of disbelievers will greatly increase the chance of Paradox, while a group of believers will lessen the chance. This explains both why a mob of angry villagers can defeat a wizard with nothing but torches and pitch-forks, and why a magician accompanied by a loyal entourage can perform extraordinary feats. This is also why certain types of magic is accepted in some areas and not in others, and why the willworker's magical style and his use of Arcane tools affects his outcome. Example: The Craftsmasons of Marburg are constantly trying to push the envelope of what the Paradigm will allow in terms of Enlightened Science. Their flying machines and clockwork contraptions are constructed in front of sleepers, and more often than not tested before a crowd of enthusiastic onlookers. While mishaps, malfunctions, and even the odd explosion occurs, each successful demonstration strengthens the local belief in the Masonic Paradigm. Likewise, the Ordo Hermetica has spent centuries enforcing their will upon their land and it's inhabitants. As for magic style and Arcane tools, an outlandish mechanical device would have a much higher chance of invoking Paradox in the Order State than in Marburg. Likewise, a wizard drawing flaming glyphs in thin air to invoke a fire-storm would have a much higher chance of provoking a back-lash in Marburg than in Göteshafen. By this rule, flavour of magic isn't just a matter of style, but also a matter of approaching the Paradigm with respect. There are ways to lessen the chances of triggering Paradox, however. By spending Mana in advance of the casting, the magician can mitigate the back-lash. This is further addressed below. The modifiers below are added to the spell-casting dice-pool, and subtracted from the Paradox-mitigation cost and the Paradox-resolution roll. Mitigation has to be done in advance of the spell-casting dice-roll, and if the player opts not to mitigate, the Paradox roll has to be resolved before the spell. Round all fractions down. If any successes are achieved, see this post for effects of Paradox. Example: Aratrax the Red prepares to cast Flight (a Vulgar Forces 5 effect) in broad daylight, on St. Militan's Square in Artugua in Aragorn (the Paradigm is hostile, and there are lots of witnesses, many of them actively disbelieving his spell – total of -5). Artarax has a Gnosis of 5, bringing the cost of mitigation up to 15 point of Mana [5 + 5 - (-5) = 15]. Unable to pay the prize, Artarax the Red then has to resolve his Paradox, rolling 5 dice [(Gnosis 5 + Forces 5) / 2 = 5]. Scoring three successes, Artarax's body is racked by magical energy run amok, and unable to cast his spell. Artarax is not having a good day. Having not acquired Mage yet, I don't know where the house rules start and the core rules end. Nevertheless, I continue to be impressed with the approach to magic in Mage--with the success of magic being dependent on believers and non-believers. Regardless of if I import the Mage system wholesale into my game or not, I'm going to get a copy. And at the very least, some streamlined rules as you have put forth here can be used to great effect. The thing I really like about magic in Mage is that it feel...magical, in a way. The cut-n-dry spell-lists from the D&D-derivates seem flat and life-less to me. The draw-back with Mage is that there's a bit of a learning-curve involved. Not only does your character have to learn the Arts, you, as a player/GM have to learn it as well. This is what drives a lot of people away from the system, as I understand. My advice would be to approach the book with an open mind, and not try to impose any preconceptions youmight have on the subject matter. Especially if you have no previous experience with o/nWoD. This results in an open approach to character-building and -development. In Mage this also applies to magic. Each Aranum has five tiers, and effects can be freely combined between the different Aracna. What this means is that unless you have a good grasp of what eavh tier, and each Arcanum, can do, you end up playing with only half the potential of the system. A word on Gnosis. Gnosis is the mage's power-stat (each supernatural WoD-creature has a different stat). Gnosis governs a few aspects of the system, as you may have seen above, and is also added to the rating of the Arcanum used to cast a spell. This gives you the dice-pool. You then roll that number of dice to determine success and potency of the effect. As for combining the magic of nMage with a level-based system, I would say it can be done. Just keep in mind that Mage isn't intended to be a class, hence it may very well overpower and/or over-shadow other classes. Then again, with enough work, anything is possible. If nothing else, reading through the book should give you some different influences to bring into your own game. Thanks for all the info. I'm not using a class-based system, but more along the lines of PDQ or Risus. I'm sure I'll get a lot of use out of reading the book. What's really funny about the Sorcerer's Crusade that you recommend is that the game I'm working on is based in Renaissance Italy. It's almost as if I was meant to use that supplement! M:tSC is not so much a supplement as an alternative setting. I seem to remember needing M:tAsc for the magic rules, but I may be wrong. I can check up on that and get back to you. One thing I do know is that it is long out of print. However, RPGnow should have it available as a .pdf. I must confess I am completely ignorant about the systems you mentioned. Presenting the effect of Disbelief as less than monolithic is certainly a nice touch, and I like Paradigm as a means of differentiating areas and magical styles. Not sure how well it would mesh with the traditional "one city, one long story" model of WoD games: there's always going to be someone whose magic is not favoured and who gets the short end of the Paradigm stick, and from a meta perspective moving around a bit to give everyone a fair crack at the magical whip seems like a useful device to avoid player drama. So the paradigm modifier applies to the mitigation, but not to the paradox roll itself? And if you pay the cost, you don't have to roll paradox? What about mitigation through dedicated magical tools? This is getting expensive. Are you going Deep Side, Harald? Yeah... That right there is something I've been pondering quite a bit. I am actually leaning towards adding the mod to to the Dox-roll as well. It makes sense, given the revised rules. As for it being expensive, yes, it is. But the RAW made doxing a remote possibility at best, especially if the caster has any Mana whatsoever. This isn't so much a game-balance measure as a flavour-enhancing strategy. The downside is some added crunching, but that's the flip-side of playing with a system, I believe. And am I going Deep Side? Me? How can you even ask such a question? I am shocked and appalled by your lack of trust. Thanks. AS for using these rules in a "classic game," I agree that it may not work as well. However, my game is more of a fantasy-story than a game of mystery and personal conflict. The nWoD rule-set is merely the chosen engine. I do think this could work in a more conventional setting as well, if you were to have the plot move the characters to different locations in the world. I would assume that the Paradigm in Abidjan would be somewhat different from, say Copenhagen. Likewise, the heart of a primeordial forest should differ from down-town in a metropolis. There, the post has been edited to include the missing modifiers.